The fourth anniversary of La Hoihoi Ea, 1847. The celebration of the fourth anniversary of the Restoration of the Hawaiian Flag by Rear Admiral Richard Thomas took place on Saturday last—July 31. The morning unfortunately was lowery, much rain fell in the valley, and some showers reached town. Notwithstanding this and the muddy roads, by early dawn, parties on foot and horseback were thronging the road to the King’s residence at Nuuanu, where the appointed feast was to come of. Vermont hears of Restoration Day, 1843. Off Honolulu, Sandwich Islands, Aug. 1843. A song for Hawaiian Independence Day, 1870. No ka la Kuokoa o ke aupuni. Me na la mua o Kamehameha. E mau ko welo haaheo ana! 2016. Tamaki Kuea, Iulai 31, 2016. 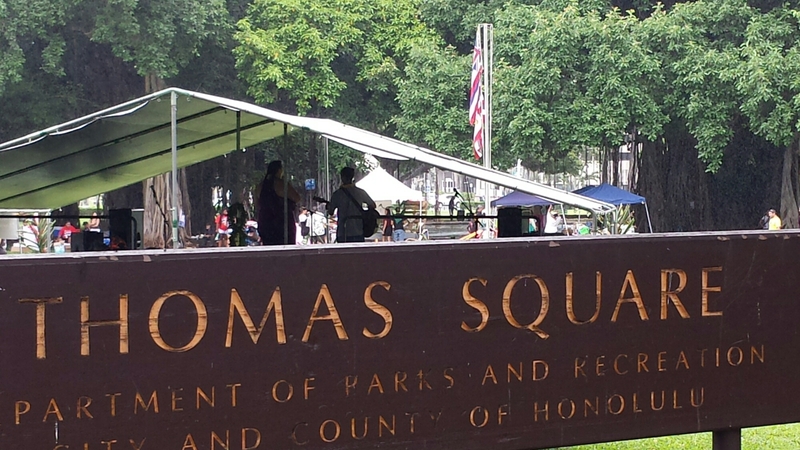 Go check out the events commemorating La Hoihoi Ea here at Thomas Square and around the pae aina! The coming Wednesday, July 31, is the day that Admiral Thomas restored the glorious Flag of Hawaii nei, after he stripped these Hawaiian Islands and took them under his power on the 25th of February 1843. And from the taking of the beautiful Flag of Hawaii until its return was five months and some days, and the glory of Hawaii was regained, for the beautiful, magnificent stripes of the Hawaiian Flag was seen once more. This day is a sacred day in the hearts of all true Hawaiians, and they commemorate the day that the life returned to the loving communities of Hawaii nei. And the proclamation proclaimed by the King, Kauikeaouli Kamehameha III was fulfilled, as he commanded all the devout from Hawaii to Kauai to kneel down and give glory to God Almighty for returning the beloved sovereignty to our homeland. It is true that the supplication of the devout was heard, for the beautiful Flag of Hawaii nei was indeed restored by the Power of God, Jehovah. Therefore, O Lahui, let us be happy and rejoice, for gaining this glorious day which established the foundation for a new step, that being the Independence of these Islands given by France, Britain, and America. Now all true faithful ones should take some time on this awesome and sacred day as time to glorify God, Jehovah almighty for his true love for us. Ka Oiaio, Buke VII, Helu 22, Aoao 4. Augate 2, 1895. Restoration Day celebration, day number 4! 1844. On Saturday, Aug. 3—Gov. 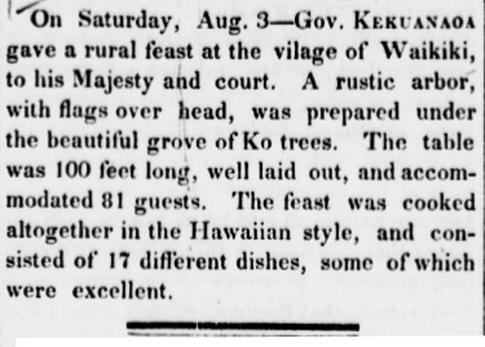 Kekuanaoa gave a rural feast at the village of Waikiki, to his Majesty and court. A rustic arbor, with flags over head, was prepared under the beautiful grove of Ko [Kou] trees. The table was 100 feet long, well laid out, and accommodated 81 guests. The feast was cooked altogether in the Hawaiian style, and consisted of 17 different dishes, some of which were excellent. The Polynesian, New Series, Volume 1.—Number 12, Page 47. August 10, 1844. Restoration Day celebration, day number 3! 1844. The dinner was prolonged for several hours, and the house illuminated. In the evening, four veterans of the father of his present Majesty, were introduced, who having seated themselves before the King and Queen, and Premier, after the old Hawaiian custom, with their calabash drums between their legs, commenced a mele, accompanying their song with rapid, and very skillful, manipulations upon their drums, and gesticulations expressive of the sentiment of their song, which was commemorative of the deeds of his warrior father, and in praise of himself and the Premier. These men are almost the only ones remaining who understand the chanting of their ancient meles after this manner, and one of them, from nineteen years disuse, failed before the conclusion. Liholiho, in his reign, kept them constantly about his person, but the taste for their exercises, seems to have almost altogether declined, as but little interest was manifested, by the guests generally, in the performance. It was interesting, however, as a relic of the past, and from its analogy to a custom of the Celtic tribes of Europe, in their era of barbarism. The pleasures of the evening were not confined to the walls of the banqueting house; a numerous crowd was assembled outside, diverted by the music of the band. At 8 o’clock, P. M. a salute was fired from Punch-bowl, with very grand effect [not legible because of fold in paper] cloud rested over the hill, and when the guns belched forth their thunder in quick succession, lighting up the hill by their flashes, and shaking the houses beneath with their heavy reverberations, it required no lively imagination to fancy that the old crater had awakened from its slumber of ages, and was about to pour a fiery flood upon the town beneath. Soon after, the troops were re-formed, and His Majesty and the court proceeded to the house of the young chiefs, where the company were very agreeably entertained by Mr. and Mrs. Cooke, the teachers of the Royal children; and by the princes and princesses themselves, by their performances on the piano, and social music, both of which was highly creditable to themselves, and gratifying to their parents. The Royal party next proceeded to the mansion of the Hon. Secretary of State. The band assembled in front of the house, playing lively dancing tunes, while the officers of the troops formed themselves into groups and danced with great vigor and animation. The effect by torch-light was peculiarly striking: all, at intervals waving their swords on high, and joined by the soldiers, giving utterance to deafening cheers, which were borne in the stillness of the night, far and wide. After experiencing the hospitality of the lady of the Secretary of State, the procession re-formed and marched at quick step towards his Majesty’s residence. The cheering in their progress through the streets was loud and enthusiastic. At 10 o’clock the company took leave of their Majesties. The Polynesian, New Series, Volume 1,—Number 12, Page 47. August 10, 1844.